In a study published in the journal Nature, researchers reported new evidence of the “Zanclean megaflood,” or “Zanclean deluge.” The Zanclean, for which this event was named, was the earliest stage of the Pliocene epoch. Archaeological evidence suggests that a great flood, one reminiscent of the Noah’s Ark story, occurred 5.33 million years ago, filling up the mostly dry Mediterranean Sea in only a few years. At that time, the Mediterranean Sea had been experiencing the “Messinian salinity crisis,” in which large portions of the sea had dried up. As the waters receded, land area increased around Northern Africa and Southern Europe. But then, the biggest, fastest flood known to science occurred. 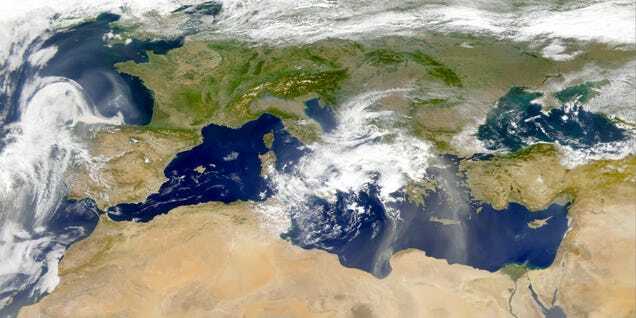 First, water from the Atlantic Ocean overtook what is now the Strait of Gibraltar, which was closed off and dry at the time, Scientific American reports. The water eroded the channel and filled the western Mediterranean. The water rose roughly 30 feet per day, rushing at 100 miles per hour, passing through Noto Canyon and filling out the body of water to be more like the voluminous Mediterranean Sea we know today. Researchers examined sedimentary rock and a 90-meter underwater cliff that seems to have been carved by a drastic and sudden flooding event, adding evidence to our body of knowledge about how the Mediterranean changed its surroundings so quickly. Stories of enormous, and sometimes global, floods are common throughout mythology. At the time, 5.33 million years ago, the Zanclean megaflood must have seemed overwhelming and all-encompassing to those who lived there. But the only creatures living around the Mediterranean at the time were non-human animals, like canines and ancestors of camels. There was no one to write anything down. Modern humans didn’t exist at the time. It’s not known when the Bible—specifically the Book of Genesis and the story of Noah’s Ark—was written, but it could not have been more than a few thousand years ago. So although this great flood occurred, it couldn’t have actually inspired great flood myths. This article originally appeared in Newsweek and is shared here as part of our collaboration with the Climate Desk.